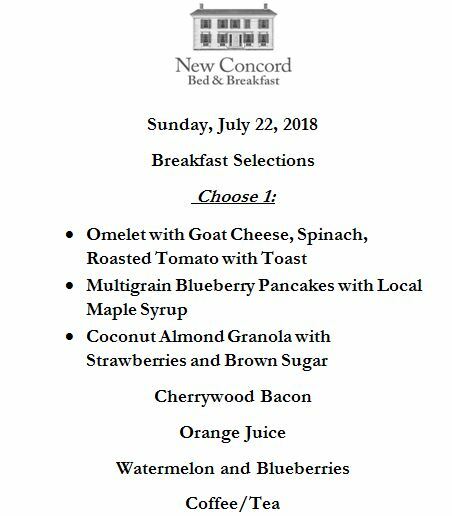 Sample Breakfast Menu | Welcome to historic elegance with all the modern comforts. We are back from our annual Winter Vacation and taking reservations for all future dates. Columbia County is full of wonderful activities during all four seasons. Hope to see you soon. We had an absolutely delightful time staying at the New Concord B&B. The room we had was charming and incredibly comfortable–especially the bed. Nancy, as always, was friendly and a joy to talk to. The breakfast was delicious, including one of the best omelets I’ve had in years. I would recommend the B&B to anyone. I have watched the painstaking renovation and overhaul of the New Concord Bed & Breakfast. The results are breathtaking. A beautiful, gracious historic home with all the modern amenities. …warm, wonderful company, delicious breakfast & beautiful thoughtfully-appointed surroundings. I will come back! Wonderful! We slept so well, enjoyed an awesome breakfast and interesting, fun conversation. This house, the host and the village—all an absolute pleasure. New Concord has an almost mystical beauty.